cupcakeMAG for Littles: Fashionable Treats for Chic Moms & Their Babes: American Girl's Shine On Now -- My American Girl Doll Giveaway! 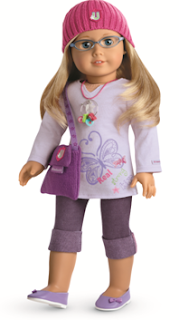 American Girl's Shine On Now -- My American Girl Doll Giveaway! As you all know cupcakeMAG & Sprinkles has partnered with Shine On Now -- if you missed our post all about American Girl's Shine On Now launch then you should check it out here! In the meantime we know everyone is busy donating stars as Shine On Now has reached more than 563K stars already since the website full launched on July 13th! To thank you all for your support we want to give a deserving girl in your life their very own My American Girl doll which you can check-out on the American Girl wesbite. Ready to win? Nominate a deserving girl in your life or in the community that you think would love their very own My American Girl doll. Write a description of how this special someone helps others and is involved - there is no need to reference the girls identity. This comment is mandatory! For extra entries, please leave a separate comment for each entry letting us know. The more you comment the better chance you have to WIN! The winner will select the doll of choice from here. 6. Tweet about this giveaway and include @cupcakemag -- you must tweet, not just follow. 7. Tweet about this giveaway and include @AGShineOnNow -- you must tweet, not just follow. The winner will be selected Wed., August 4th on or around 11pm! US Residents only. While you wait check out Shine On Now and make sure you follow them on Twitter and like them Facebook! Also, make sure to check out Shine On Now on YouTube! We are Shine On fans on Facebook! My 4 y/o DD and I would like to nominate my friend's daughter Osjah. Osjah is a very special young lady with a very big heart. She has created Osjah's Wish which is a project in her own words "My main project this year is adopting Timucuan Elementary School. It's a low income school of roughly 600 students. I'm collecting backpacks and school supplies to hopefully cover all 600 students. Then I'll work on funding a field trip for an entire grade and other projects throughout the year. We're even going to have a back to school breakfast for the teachers the day they return in August thanks to UNF STarbucks!" Osjah has an amazing project going on and has planned almost every aspect of it on her own besides getting the support she needs from adults to make it happen. In these hard economic times it is refreshing to see a child like Osjah going out and trying to make a difference for every child at this one school. I would like to win this for my daughter who loves American girl dolls but I can't afford one for her. She wishes to have a My American Girl doll to get access to innerstarU. I have "liked" you on my facebook and wrote a blog. Thanks! I'd nominate my neighbor (9 years old) who is involved in swimming & gymnastics. She helps others by babysitting & just being sweet to the other children in the neighborhood. I would like to nominate my daughter. She has been reading since 3, and loves books! She is also very sweet and caring, always helping, sharing, and playing with every kid she meets. She would love an AG doll, but I can not afford one at this time. Our grand-daughter was diagnosed with autism shortly after her second birthday. She is now six year old and after three years of in home behavioral therapy, was able to start in a mainstream kindergarten last fall. Her social skills have so improved during this last year. She has made amazing progress with the help of her wonderful therapists, tutors and teachers. Our girl is in gymnastics, taking swimming lessons (with great success), and has just started playing soccer on a team. She has a tender heart and is always helping out if anyone is in distress. Pats on the back and “It’ll be okay…” Also, she is quite a help around the house. She likes to help set the table and is very good about putting play things away when she is through with them. When we get together with other families with kids, “C” is always the leader. She currently loves playing “Pre-school” with these kids..and, of course, she is “Miss. C”, the teacher. It is so much fun to see her read to them and then turn the book to show them the pictures. Her younger brother especially likes to play this game. Who knew that learning to read would be so much fun. This will be our families third year to do the Walk Now for Autism here in our city. Our girl invites all her family and friends to join her team and do the walk. Last year, she invited her lives.whole kindergarten class. We make this a family/friends walk and over 75 people were on her team, doing the walk. It is a love fest as we are determined to have each and every one of our children lead full, productive lives. She is proof, WE CAN MAKE A DIFFERENCE. my little sister is a great kid. She is nine and enjoys reading the American Girl series. She is very smart and acts like she is elderly already :) She regularly donates money to charity and is active in church. I am so proud of her and I am excited to see who she becomes. I subscribe to your updates. I do "LIKE" you on your NEW Facebook page. I would like to nominate my daughter A. She is such a sweet girl! Last year she was saving to fix an American Girl that she found at a second hand store (it was in REALLY rough shape) and then at Christmas time noticed a little girl in her first grade class that wasn't going to have anything for Christmas. My daughter chose to use her money to get this girl a gift instead of using it for herself! She then helped put together hygiene kits to send to Haiti. She has such a big heart and is so aware of those less fortunate around her! I am so glad to have her as my daughter! She teaches me about service and kindness everyday!! My oldest granddaughter is the person I would nominate. She is only 6 but she already shows that she is ready and willing to give of herself when needed. We have started letting her volunteer at the local animal shelter and she loves it. We routinely donate toys and clothes to Goodwill and she is the one telling her siblings about how happy that toy would make another little boy or girl. I "LIKE" you on your NEW Facebook page. I subscribed to updates via email. Tweet about this giveaway and include @cupcakemag -- you must tweet, not just follow. I would like to nominate my 8 year old daughter. She is a beautiful, amazing girl who will help anyone who is in need of help. My husband and I are both active duty military members and we have to go away for deployments, training, etc quite often. So when other kids' parents are deployed, etc, she knows what they are feeling, etc and will be there to listen to their worries/concerns or just there to give them a hug. She is also very into recycling and will pick up trash whenever she sees it on the ground. She also does very well in school and will help her little sister out whenever she needs it. She's also involved with numerous projects such as Backpacks for Love and Toys for Tots. Tweet about this giveaway and include @AGShineOnNow -- you must tweet, not just follow. VOTE for us on Top Mommy Blogs here -- just select "click to vote" -- you don't have to register - just a simple click. The girl I would like to nominate has a huge heart of gold. She enjoys helping and playing with the younger kids at the child care center. She would drop anything to help someone. Through her Girl Scouts group and her 4-H group she has had the chance to reach out to others in our community and learn how amazing it is to help others. Her interests include music, horses, books, and making movies. She is a beautiful person and I am very proud to call her my daughter. done I RT your tweet..
My daughter helps by collecting food. She has done food drives, helped her Aunt (who works for County's foodstamp program) load up trucks of food that the Post office has collected. HElped hand out info on getting foodstamps at local events. Collected jackets for a school warm drive. My 5 year old daughter is incredibly generous and kind. She wears her heart on her sleeve and loves to share gently used toys with other children who need them. She is beginning kindergarten this year and I would love to give her a doll to help with the transition.